This Voltage Regulator lamp was sent to me, baseless by another collector to have a B22d-3 cap and resistors fitted so it could be operated directly off the mains to show the discharge colour. This picture was taken shortly after receipt of the lamp. This is nice , and very interesting . Its interesting that its British made GEC , I have never seen one like this and I love voltage regulators. (I have a large number of the traditional "valve" type ones). Thanks Andrew, I have had one of these in my collection for years and really no idea what it was! It is simply marked "GEC Type B". Do you have any further details about its specification? No James. It is Fin's so he may know. 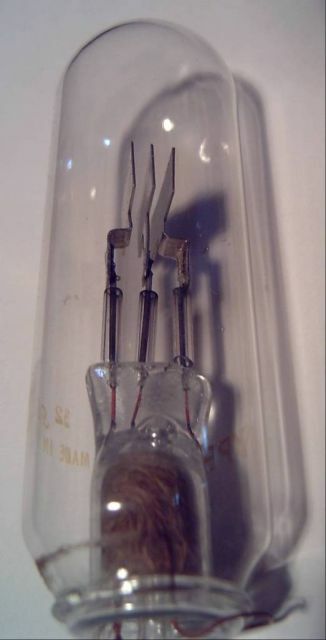 I suspect it was used in regulated power supplies in some sort of bridge/balance circuit, hence the two outer electrodes and single inner electrode. I only know what bthe oscilloscope and spectroscope told me, but looking in a valve web site, like the "Virtualvalvemuseum" may reveal more info and possibly a datasheet.